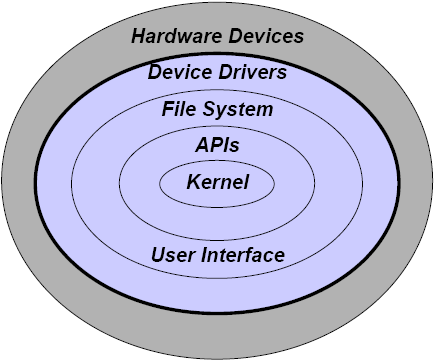 The heart of a modern computer is one or more Central Processing Units. A CPU gets its instructions from memory. The CPU reads instruction from the BIOS and searches for the hard disks, CD drives and other hardware. The BIOS program looks at the first sector for boot code. Devices that feed the initial CPU instructions are known as bootstrap media. (*) In modern computers BIOS chip can be rewritten, allowing BIOS software to be upgraded. POST tests the computer to ensure that it is working as it is supposed to. POST can detect some errors with the processor, motherboard, RAM and other memory, as well as the video card. Most BIOS chips use a system of beep codes to indicate the POST status to the user and each BIOS chipset uses a different code. The IBM PC BIOS code standard, for example, uses one short beep to indicate a successful POST and two short beeps to indicate a POST error while AMI BIOS uses these same beep codes to indicate a DRAM refresh failure or parity circuit failure, respectively. What is a plug and play BIOS? Prior to Windows 95 the BIOS was responsible for managing all hardware devices such as the floppy and hard disk drives, serial and parallel ports, video and network cards, the keyboard, and system clock. When hardware was added to the system, the user adding the hardware had to set a variety of parameters such as the starting address in memory where the buffers and startup code could be found as well as the interrupt priority level (IRQ) of the device. Windows 95 introduced Plug-and-Play (PnP) BIOS which automates the process of detecting and adding hardware to a system. In addition to making it far easier for the user to add hardware devices -- PnP eliminated hardware conflicts that could cripple the PC. The first 512 bytes on a hard drive -- aka Logical Sector Zero -- contain the Master Boot Record (MBR). The MBR contains the boot code and the partition table. The partition table identifies the file system on the partitions on the disk; there must be at least one. The boot code processes the partition table to identity which partition is bootable; control then transfers to the first sector, called the boot sector, of the active partition (there can be only one). The boot sector is operating system-specific. OS and volume file system-specific information. The boot code in a DOS disk exists in the first 446 bytes of the first 512 byte sector, which is the MBR. The end of the sector contains the partition table. Boot sector viruses insert themselves into the first 446 bytes of the MBR so that they are executed every time the computer is booted. 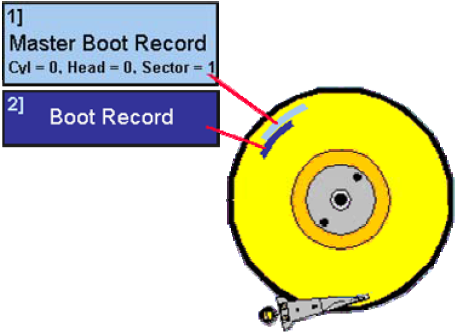 The master boot record is read from the first sector of the disk, and the four partition table entries are identified and processed. In a DOS based disk the partition table and boot code requires only one sector, yet 63 are typically allocated for both the MBR and extended partitions because the partitions start on a cylinder boundary. When parts of a partition table have become corrupt, it may be necessary to search for the extended partition tables. To find the extended partitions, a search for 0xAA55 in the last two bytes of a sector could be conducted. If a sector is found to be a boot sector of a file system, a partition table may exist 63 sectors prior to it. MacOS Multi-tasking, single-user, excels at network-based resource sharing. Used AppleTalk protocol prior to TCP/IP support; Linux-based since OS X.
Novell NetWare Network operating system used for resource sharing; supports Windows and Mac clients. Dominate NOS in the 1990s using IPX protocol; Linux-based since NetWare v5 using TCP/IP. Unix Multi-tasking, single- or multi-user OS. Predominant server OS on Internet servers; has always used TCP/IP. Provides the capability to create, modify, and delete files, examine directories, etc.